A cracked tooth is not only painful but also opens you up to the possibility of infection. Cracked teeth can happen by chewing on hard foods like ice and hard candy. Though this isn’t always the case, many people who end up with cracked teeth have already weakened their teeth by grinding and clenching their jaws. How do I know if I’ve cracked my tooth? Oftentimes, when a person cracks their tooth, they heard a cracking or snapping noise. If, however, you don’t hear this but do experience sharp pain when biting down, pain that comes and goes, pain when eating or drinking, or just feel like your bite is off you could have a cracked tooth. Even if a fracture doesn’t appear on an x-ray, there’s still a chance that a crack exists. Talk to Dr. Adam Harkrider. He has extensive experience treating patients with cracked teeth and knows the subtle signs to look for that could indicate a crack. What makes a cracked tooth so painful? A cracked tooth is painful because it will often create an opening that irritates the pulp, where the tooth’s nerves and blood vessels are located. Typically the irritation will cause the tooth to be sensitive to heat and cold. 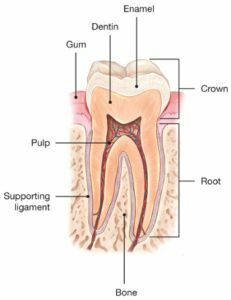 When the pulp is damaged, there’s usually a need for treatment in the form of a root canal. This is often necessary to save the tooth and avoid needing a prosthetic to replace your natural tooth. Treatment of a cracked tooth depends on the severity and location of the crack. When you come to Harkrider Endodontics in Boerne, Texas, you’ll first undergo a consultation. Dr. Harkrider will discuss what symptoms you’re experiencing and perform a physical evaluation. 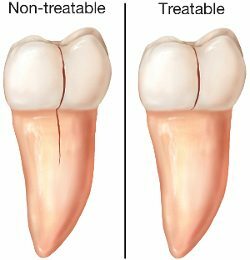 If he decides you have a cracked tooth and it needs to be treated he could recommend a root canal if the pulp is impacted, an extraction if the crack is bad enough that the tooth cannot be salvaged, a filling, use of a crown to protect the tooth from additional damage.